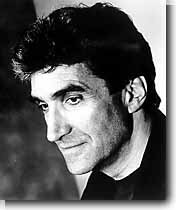 ROBERT PINSKY is the current Poet Laureate Consultant in Poetry at the Library of Congress. He is focusing his work on the Favorite Poem Project which will create an audio/video archive of 1000 Americans -- from every state with varying regional accents, ages, levels of education, professions and ethnicities -- reciting their favorite poems. He says, "The Favorite Poem Project offers a unique way to learn about poetry -- through people who love it. The archive will be a gift to the nation's future." Born in 1940 in Long Branch, New Jersey, Professor Pinsky first had his imagination captured just by the way words sounded such as the train conductor's cry, `Passengers going to Hoboken, change trains at Summit." He developed a love of music as a saxophonist and his initial writing was more often songs than poetry. He later earned a bachelor's degree from Rutgers University, and then attended Stanford University earning prestigious fellowships in support of his master's and doctoral work in English. "If anyone is around to ask in a thousand years, `Who were the Americans?' one of the three or four things they'll mention, I hope, is they created poetry that influenced the world." His collection of essays, Landor's Poetry was published in 1968 and was followed by other essay collections in 1977 with The Situation of Poetry and Poetry and the World (1988) which was nominated for the National Book Critics Circle Award in Criticism. He received a National Endowment for the Humanities Fellowship in 1974 and in 1975 published his collection of poems, Sadness and Happiness. Other poetry collections followed: An Explanation of America (1980) which won the Saxifrage Prize; History of My Heart (1984), awarded the William Carlos Williams Award of the Poetry Society of America; The Want Bone (1990); and, The Figured Wheel: New and Collected Poems 1966-1996 which was nominated for the Pulitzer Prize in Poetry, and was awarded the Ambassador Book Award in Poetry of the English Speaking Union and the Lenore Marshall Award. Professor Pinsky is renowned for his translation work, most notably The Inferno of Dante (1994) which won the Los Angeles Times Book Award in poetry, the Academy of American Poets' translation award, and was a Book-of-the-Month-Club Editor's Choice. He has received many other literary awards and honors. In addition to a long career in teaching, currently at Boston University, he has served as Poetry Editor of The New Republic. He is currently the poetry editor of the on-line magazine Slate. He notes that, "poetry is itself a technology...like the digital computer, verse is a memory system; a means of storing information that can be called up with great speed, compactly." Dr. Pinsky lives in Newton, Massachusetts with his wife Ellen Pinsky, a clinical psychologist. They have three grown daughters and a grandson.